It’s time to start thinking about summer camp! 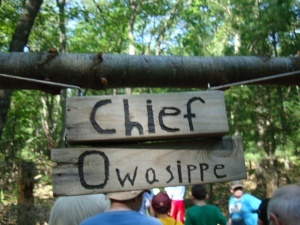 We will be returning to Owasippe Scout Reservation near Whitehall, Michigan between July 14th and July 20th. This year we will be returning to Camp Blackhawk at site #19. Camp Blackhawk lies on the shores of Big Blue Lake and is rich in tradition, with roots dating back to the early days of Scouting. 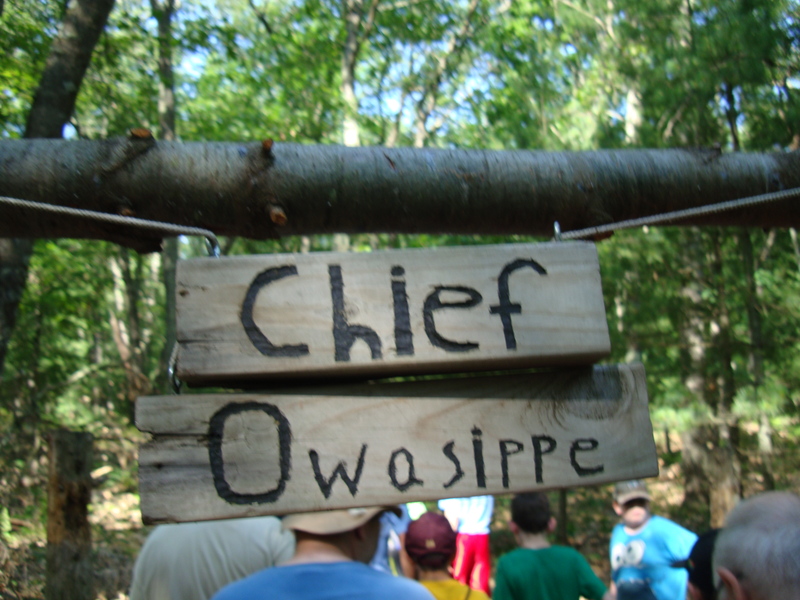 As one of the Owasippe Scout Reservation camps located in beautiful West Central Michigan, there are 4,800 acres to explore and enjoy. Along with its long-standing traditions, Blackhawk also has modern facilities like the camp’s handsome Dining Hall, which is filled three times a day with Scouts from all over the Midwest. 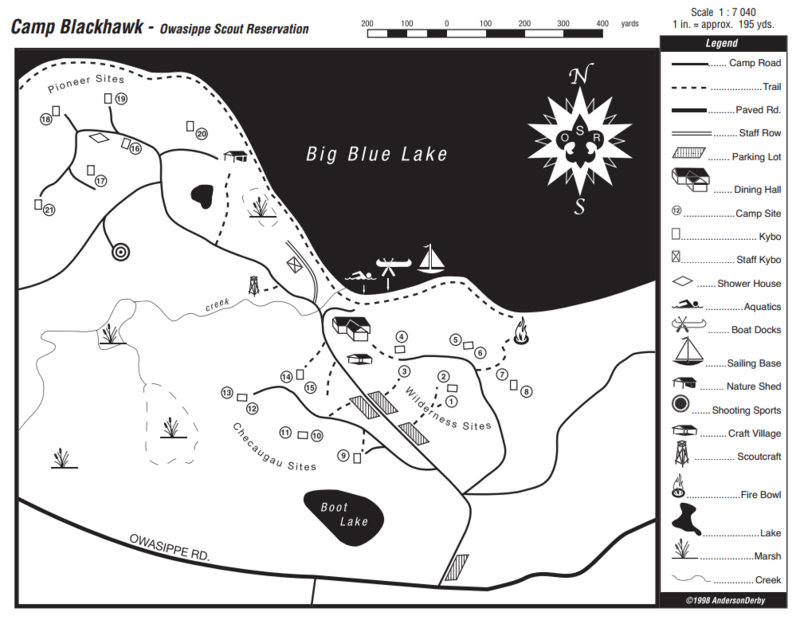 Blackhawk has 25 campsites located on hills overlooking Big Blue Lake. The sites have washstands, hot water showers and flush toilets. Looking out from the Dining Hall, one can see beautiful Big Blue Lake, with its sandy swimming beach. Its docks are set up to create the perfect swimming hole. Swim instruction takes place here, while boating activities can be found down the beach. The camp also offers great programs in Scoutcraft, Ecology/Conservation, Nature, and Aquatics, along with Shooting Sports and Handicraft. 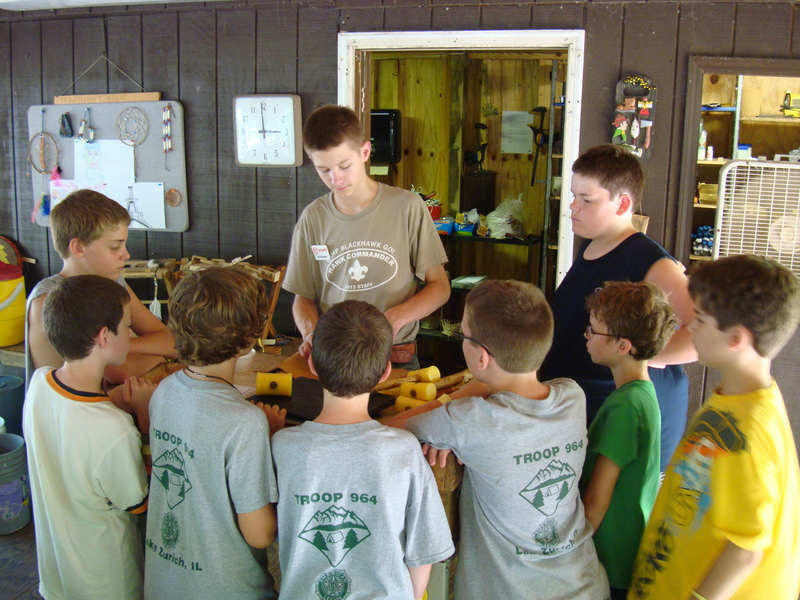 A wide variety of merit badges are offered in each program area. 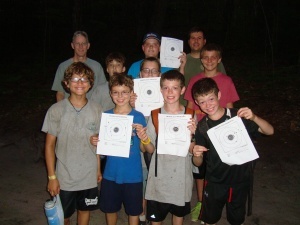 Scouts: Provide a check (or scout account) for $355 payable to Troop 964. Fee includes pizza, subway and monster shakes. Adults: For adults/Leaders staying the entire week, provide a check for $210, assuming you paid the deposit. Fee includes pizza, subway and monster shakes. The daily rate is $35 if you are not staying the entire week. Campership application must be completed by the end of March. Our district is Signal Hill. 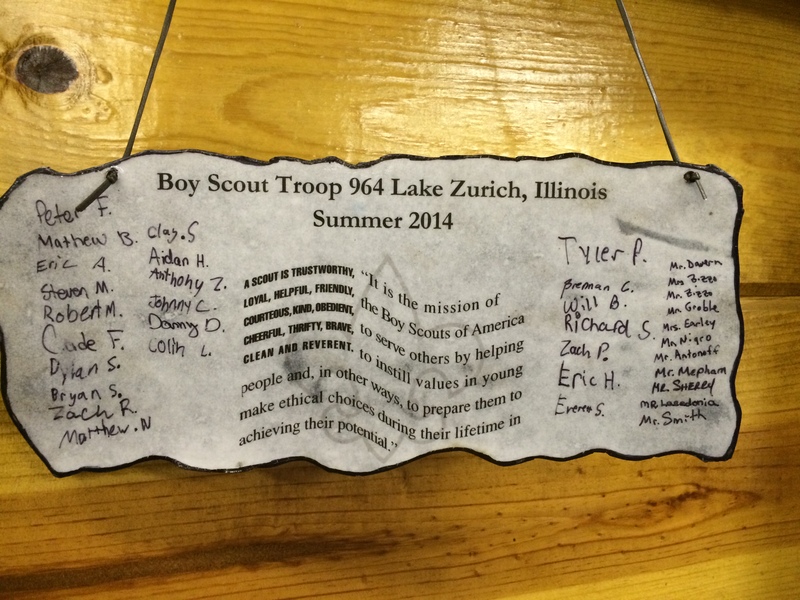 Scouts who joined the troop prior to January 1, 2019: Provide a check for $355 payable to Troop 964. Fee includes pizza, subway and monster shakes. Adults: For adults/Leaders staying the entire week, provide a check for $210. Fee includes pizza, subway and monster shakes. The daily rate is $35 if you are not staying the entire week. BSA Medical Forms (Parts A, B, and C) are due June 17th, unless the physical cannot be scheduled by that date (please discuss with Mark Smith). You should have already completed Parts A and B during troop registration in January. Part C requires a physical be performed within the last 12 months of summer camp (since July 21, 2017), and signed by a doctor. A copy of your medical insurance card is also required. An electronic copy of the medical form is attached. Sign up on the troop website (this page). 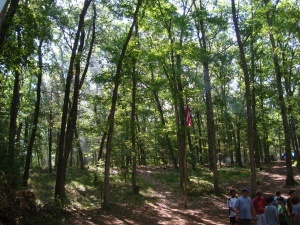 The Troop provides lunch on the way to and from summer camp. If your son is not riding up and back with the troop, see Mark Smith for an adjusted cost. There are a number of outposts that the Scouts can sign up for such as small boat sailing,horsemanship, and shotgun. (First year Scouts do not generally signup for outposts.) If your son plans to sign up for an outpost, the required fee is due by June 17th. The registration form showing the outposts and associated fees will be provided once it is available. Begin sending mail to scouts (adults enjoy mail also); you can mark the day to open if multiple are sent. Saturday, July 13, 4:00 PM: Trailer prepack at the Legion. We need all scouts attending summer camp to participate. We will load/unload Trailer and load/unload basement with troop gear needed for summer camp as well as load individual gear onto the trailer. NO personal gear will be loaded onto trailer Sunday July16th (departure day). If you are unable to attend, please make prior arrangements for your gear to be dropped off. DO NOT pack any medication in personal gear, these will be collected on Sunday July 14th before departure. You do not need to wear your uniform. Sunday morning, July 14, 5:30 AM Meet at the Legion parking lot. NO GEAR WILL BE PLACED ON TRAILER ON SUNDAY. Meet at the Legion dressed in Scout shirt and wearing swim suit. Towel should be accessible. Eat breakfast before you arrive. Saturday, July 20, Afternoon Return to the Lake Zurich. We will be meeting at Sarah Adams this year due the Alpine Day parade. Scouts will call their parents when we are about 30 minutes away. Thank you in advance for volunteering your time to help the boys going to Owasippe this summer! We could not offer this great opportunity to our Scouts if it wasn’t for our dedicated leaders and parents. As most of you know, there are several forms and a youth protection training requirement for Owasippe. 1) Youth Protection Training – please print out the certificate and provide a copy to Mark Smith. The link is: https://myscouting.scouting.org/Pages/eLearning.aspx. Create an account if you do not have one, then go to e-learning. We will need proof that you have completed this training within the past 2 years. 2) Michigan Youth Protection Agreement – please complete the form and provide it to Mark Smith. 3) Illinois Background Check Form – please complete the form and fax/mail or email directly to DCFS. This should be done soon since there may be a lengthy turn-around time. See instructions on the form. Owasippe keeps the results of this check on file, so If you have completed this form in the past for Owasippe, you do NOT need to do it again. 4) Medical Forms – parts A and B are required, part C only if staying more than 72 hours. Part C requires a physical. Adult registration Fee is $210 due June 17th or $35 per day if you are not staying the entire week. Fee includes pizza, subway and monster shakes.